According to the American Academy of Dermatology, skin cancer is the most common cancer, with one in five American's developing skin cancer in their lifetime. However, with early detection the survival rate is good. 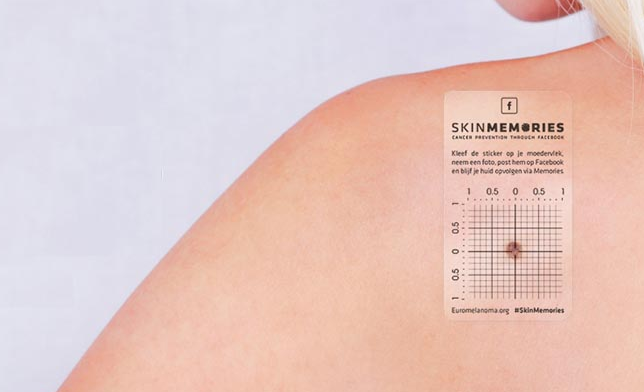 Euromelanoma Belgium created a unique way to utilize a Facebook feature to help detect possible skin cancer. They started by developing a clear patch for their campaign Skin Memories, then asked people to put the patch on their skin, take a picture and upload it to Facebook. By doing this, they will be able to use Facebook Memories to automatically remind them to recheck their skin and see if there was a change in size year over year. I love this. The seamlessly interjected themselves into their audience's daily social media experience in a completely relevant and non-obtrusive way to strengthen awareness and hopefully a contribute to a behavioral change.